This is a collection of reviewed research chapters, offering a comprehensive overview of recent developments in the field of urologic oncology. The book comprises chapters authored by various researchers active in the urologic oncology area. To examine progress in cancer survivorship care, participants highlighted opportunities to improve the planning, management, and delivery of cancer survivorship care. This publication summarizes the presentations and discussions from the workshop. This volume Evaluates the carcinogenic risk to humans posed by infection with three schistosoma trematodes, three liver flukes and Helicobacter pylori, selected on the basis of a causal association between infection and the development of cancers. The book provides an overview of the epidemiology, pathology, and evidence-based treatment options for patients with all stages of melanoma. These aspects are presented in two sections: epidemiology and pathophysiology, and therapy and management. The endoplasmic reticulum (ER) is an organelle crucial to many cellular functions and processes. ER has a well-established central role in anti-tumor immunity. Perhaps best characterized is the role of the ER in the processing of antigen peptides. According to the American Cancer Society, more than 1.6 million people will be diagnosed with cancer during this year. Evidence supports rapid activation of critical care services leading to improved outcomes in cancer patients. 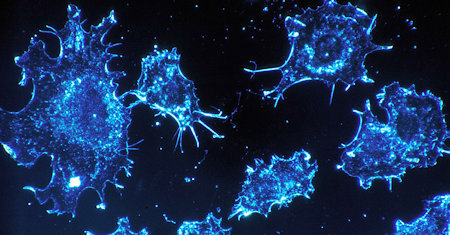 Metastasis is the major cause of cancer-related death. The mechanism underlying metastasis is complicated and poorly understood. Recent advances in tumor metastasis research have led to improved diagnosis and clinical management of cancer. This guideline aims to facilitate standardisation of practice in treating non-Hodgkin's lymphoma. But because of the rapid development of new therapies as a result of improved understanding of the disease, continual re-evaluation will be essential. In this volume, we seek to explore novel mechanisms of cellular transformation by oncogenic viruses, the role of viral infection in cancer development in understudied body sites and the potential role of novel viral pathogens in cancer development. Mammography remains at the backbone of medical tools to examine the human breast. The early detection of breast cancer typically uses adjunct tests to mammogram such as ultrasound, positron emission mammography, electrical impedance, and others. Many components of current novel therapeutic modalities for HCC are discussed in the current version of the book within the framework of a multidisciplinary approach with special emphasis on emerging treatment approaches and research strategies. This publication was developed as part of the IAEA's work on the integrated cancer prevention programmes in order to reduce the cancer burden worldwide. IAEA strategies have particularly focused on the needs of low and middle income countries. Cancer Treatment: Conventional and Innovative Approaches is an attempt to integrate into a book volume the various aspects of cancer treatment, compiling comprehensive reviews written by an international team of experts in the field. The prognosis for individuals with liver cancer is frequently poor. The topic of liver tumors is comprehensively reviewed in this book, with a focus on recent developments and improved techniques relevant to both researchers and clinicians. Angiogenesis is an extension process of the cardiovascular network. It is usually triggered by the demand of oxygen and nutrients from the fast growing tissue and uncontrollably dividing cells, as seen during wound healing and tumor progression. Gastric cancer is the second most common cause of cancer-related death in the world. The book makes an insight into the assessment of premalignant lesions, management of early gastric cancer, risk and protective factors in gastric carcinogenesis. This clinical guideline is relevant to all healthcare professionals who come into contact with patients with colorectal cancer or suspected of having colorectal cancer, as well as to the patients themselves and their carers. Cancer remains a major clinical challenge as a cause of death due to its frequent poor prognosis and limited treatment options. This book addresses various cancer management related topics including new approaches for early cancer detection. The era of therapy for GISTs is being proclaimed as bringing the message of special importance to the pathologist role in multidisciplinary team that are responsible for treating patients with locally advanced or metastatic GIST. These clinical guidelines review a number of clinical questions that involve the detection, diagnosis and initial management of ovarian cancer and which focus on areas of uncertainty or where there is a wide variation in clinical practice. The book provides a description of noninvasive imaging modalities in diagnosing cancerous tumors of the skin, proffers an analytic framework for assessing the applications of the imaging modalities, and summarizes the state of ongoing research. This systematic review of cervical cancer screening focuses on when to begin screening and on updating test accuracy and harms data on liquid-based cytology (LBC) and human papillomavirus (HPV) testing, either alone or in combination with cytology. These guidelines have been developed to help all those involved in the management of advanced breast cancer. The authors have tried to concentrate on those areas where it was felt uncertainty or practice variation currently exists. This is a summary of the current information available regarding the epidemiology of breast cancer regionally, nationally and internationally. Its purpose is to provide the guidelines on early and locally advanced and advanced breast cancer. The guideline covers twelve groups of cancers: lung, upper gastrointestinal cancers, lower gastrointestinal cancers, breast cancer, gynaecological cancers, urological cancers, haematological cancers, skin cancers, head and neck cancers, etc. Breast cancer is a malignant tumor that starts from cells of the breast. A malignant tumor is a group of cancer cells that may grow into surrounding tissues or spread to distant areas of the body. This document refers only to breast cancer in women. This textbook is meant to be used by residents, medical students, and practicing physicians in radiation oncology. Its main purpose is to be a useful reference for those wishing to gain knowledge about clinical radiation oncology. Comparative oncology has undergone a special development over the past decades and has attracted the interest of researchers who have studied the etiopathogenesis, morphogenesis and epidemiology, as well as the carcinogens of tumor disease. Written as a comprehensive reference, it will be a useful reference for clinicians and researchers. This release includes chapters on Peutz-Jeghers Syndrome, Familial Atypical Multiple Mole Melanoma Syndrome, and multiple endocrine neoplasia type 1. Many cancer patients are diagnosed at a stage in which the cancer is too far advanced to be cured. There is tremendous opportunity to improve the outcome for people with cancer by enhancing detection and treatment approaches. The latest facts on the management of all cancers. This illustrated handbook expands on the most current techniques on screening, diagnosing, staging, prognoses, treatments, and outcomes. Written for both the clinician and patient. A reference source for medical oncologists, radiation oncologists, internists, surgical oncologists, and others who treat cancer patients. The book covers the ever-widening sphere of current cancer knowledge and clinical practice. The author explains cancer genetics, carcinogens, and aging and provides novel integrative insights. The book emphasizes both the multiscale dynamics of the disease and an approach that synthesizes empirical knowledge with mathematical theory.